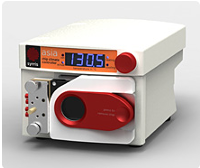 The Asia Chip Climate Controller enables a range of glass microreactors to be cooled or heated from -15ºC to +150ºC without the need for an external circulator or cold water supply. The Peltier based system ensures quick and accurate temperature control within a very compact module. The Asia Chip Climate Controller can be manually controlled from its front panel or automated from an Asia Pump or a PC using the Asia Automator. Temperature set to 1ºC and displayed to 0.1ºC. Outer materials: Aluminium, stainless steel and polyurethane sprayed white with highly chemically resistant epoxy paint. PTFE, glass and anodized aluminium door.